Martha Stewart's euphemism for prison was to call it "Yale." "I always wanted to go to Yale," she chuckled during an appearance Monday on David Letterman's "Late Show" on CBS to promote her two new TV shows. That was her coping mechanism during her five-month prison sentence for lying to authorities about a stock deal. She said she accepted the sentence instead of waiting for the appeal because she wouldn't have been able to do her shows with the uncertainty. Stewart's new daytime talk show premiered last week and her prime-time role in "The Apprentice" begins Wednesday. 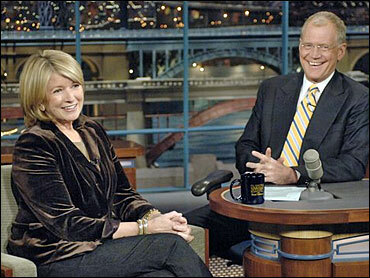 "Martha Stewart is with us tonight, and she's going to show us how to dig a tunnel with a melon-baller," said Letterman. "You didn't visit me!" Stewart chided Letterman. While the prison experience was "pretty horrifying," Stewart said it taught her how strong she was. "I did not allow myself to get depressed," she said. "I did not allow myself to get down too much. I faced what I had to face. I lived through it, actually, with flying colors, if you can live through `Yale' with flying colors." Stewart said she can't remember her first day at the women's federal prison in Alderson, West Virginia, at all. "I asked my fellow inmates a couple months later, I said, 'How did I behave that first day?' because everyone was watching me," she said. "They said I was walking around in a daze." Stewart said she made many friends there. Her fellow inmates were mostly friendly, although she heard some remarks behind her back. There were no prison yard brawls — although authorities were suspicious one day when she fell against a wall. "I slipped on some wet floor and I got a really bad black and blue mark on my arm," she said. She was called in by authorities who "wanted to know who I had been in a fight with," she said. The lessons Stewart learned at 'Yale?' "The rehabilitation really is non-existent for the most part," and anyone can live for five months without good food and luxuries. Stewart, by the way, actually attended Barnard College, which is affiliated with another Ivy League school, Columbia University.